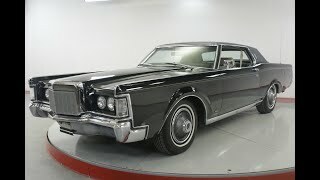 Hi, I am interested in your 1969 Lincoln Continental (stock #MJNT069) listed on Autotrader for $15,900. I'd like to get more information about this vehicle and confirm its availability. The Lincoln Continental is a series of mid-sized and full-sized luxury cars produced by Lincoln, a division of the American automaker Ford Motor Company. Introduced in 1939 as a personal vehicle of Edsel Ford, who commissioned a coachbuilt Lincoln-Zephyr convertible as a vacation vehicle to attract potential Lincoln buyers. In what would give the model line its name, the exterior was given European continental styling elements, including a rear-mounted spare tire. Produced for 55 years across nearly eight decades, there are ten generations of the Lincoln Continental.